A sequel series to the fantastic Mass Effect trilogy on last gen was inevitable. The developer, Bioware, switch it up brilliantly between Dragon Age and Mass Effect releases. Returning to such a critically acclaimed franchise with quite a few years break can be challenging. To say my expectations, and I presume everyone else, were high, was understating it. While the ending of the previous ME trilogy had been criticised, the franchise as a whole was an excellent sci-fi RPG and third person shooter combination. Having redeemed a free EA Access voucher the same month as release for ME:A, I not only got a small discount on the game, but I also had the chance of playing the first ten hours nearly a week ahead of release! My save continued over to the full release too, which gave me time to try the beginning of the game twice actually, as I couldn't decide what my fem-Ryder should look like. The default face looks kind of more detailed, while the custom one made my playthrough more unique. 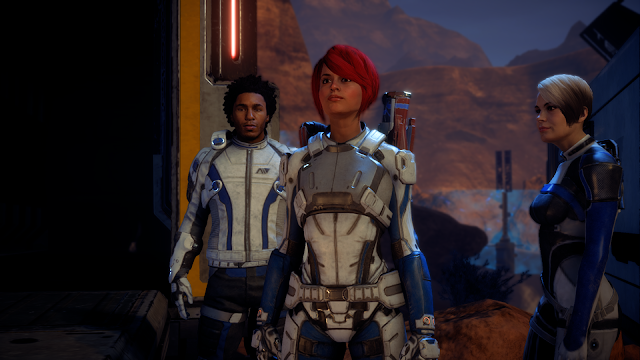 So as a tribute to my favourite videogame heroine; Regina, I went for short red hair. 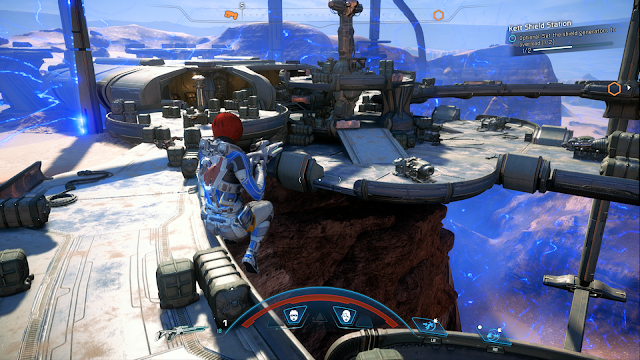 As the role of either a female or male Ryder sibling, both are featured in the game regardless of your custom gender choice, who is a part of the Andromeda Initiative. A huge fleet of exploration spaceships sent out in the hope to find liveable planets for in the Andromeda Galaxy. 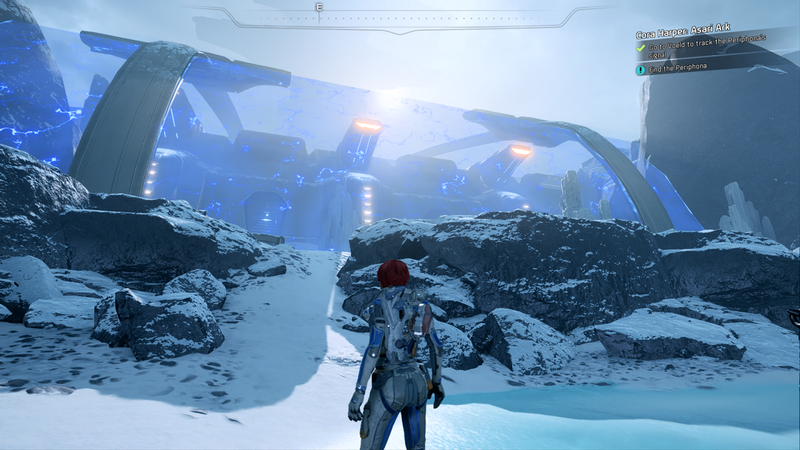 Setting out on it's journey in the timeframe Shepard from the first trilogy lived, you start the game by waking up from a 600 year journey in a frozen sleep state. It's quite clear the game seems to set itself far away from the story of the original games as a sort of statement of a fresh start to a new series, however it keeps the ME feeling very much intact. The first area of the game learns you the basics of control; movement and combat. You quickly discover the neat jumping boost move this time around, making it easier to traverse the more open ended environments. Strangely though, the rolling mechanic isn't present from ME3, probably planned considering the less indoors and square design of the old games. Even on this first little planet visit, the game introduces a neatly confined but open ended structure to it. Letting the player get a feel for things to come and to understand that mission critical checkpoints can be taken in your own order. 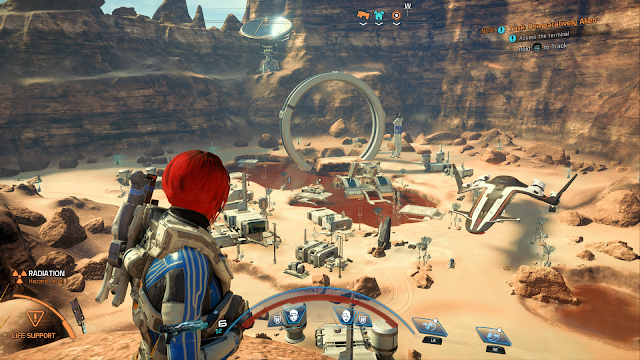 The main planets of the game though, is where you really understand how huge the levels have become. Much like how large the car-only planets in ME1 were, only this time around with tons of actual interesting areas to explore and discover. I love this new direction, it perfectly balances open world gaming with a more linear structure that takes you from location to location, rather than the whole game being one big play area. This fits perfectly with the fact that such a space exploration game needs planet diversity, spanning from from boiling, desert surfaces to cold and icy ones. Only on my first proper planet visit I'm finding secrets, ancient ruins, underground complexes and ending up terra-forming a whole damn planet. Then, you venture forth to setting up the first exploration center of the Andromeda mission, thus starting colonisation of the planet for mankind. Further more, I must secure the base from enemy attacks and progress on making the planet a liveable place again from it radioactive previous state. I mean, words can't really describe the huge, monumental tasks I doing and the fantastic sense of pioneering space exploration! And that's just the very first planet and the early hours of the game. 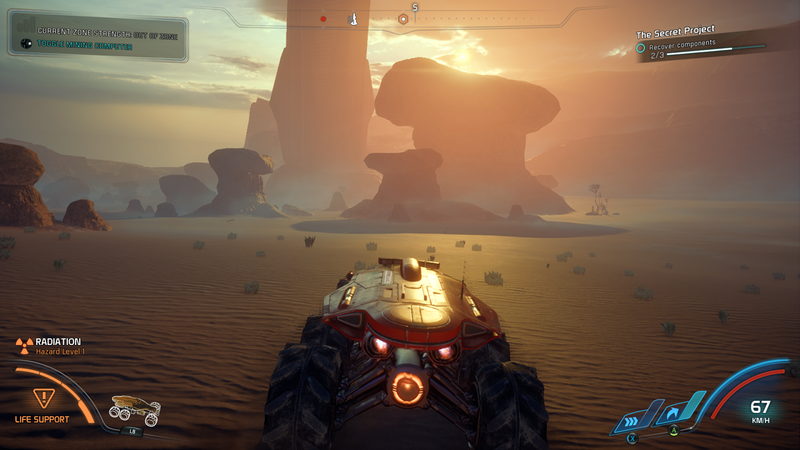 It's like Bioware took all the good parts from the older games; the big, open and driveable planets from ME1, the tight and satisfying shooting combat from ME2 & ME3 and the amazing presentation from all of them and mixed it with a modern, yet not overdone, open world approach and achieved something truly unique. It gives the game not only a sense of, but also actually delivering you the freedom of massive scale the previous games lacked at times. It's that grand feeling you would imagine space exploration would be. Sure some of tasks on the planets are repetitive, but the maps are never overcrowded with stuff to do, and usually have a side story with cutscenes in them. Making venturing into the side missions are more tempting and interesting fare. While there's been numerous posts online about how the facial animations look somewhat stupid at times, I personally didn't find them more distracting than the previous games. Comparing a game where you can make your own character and change the tone of a conversation mid-way to very carefully scripted cutscenes in more linear games is a little unfair. Sure ME:A, much like Fallout 4, can fare into uncanny valley with it's characters expressions at times. However the facial animations do the job fine, characters look detailed and are a big upgrade from the older ME titles. The running animation though, is still laughably ME 3 bad, it needs to be fixed! Physics wise the game could give me a slight glitchy feeling at times, like it's missing some extra hours of polish. While the combat is very satisfying, giving room for a lots of tactics with it's wide range of attacks and defence, I still found enemies falling strangely around after being shot or crude cover detection as you try to hide behind an object. These are hopefully issues that get fixed in an update. I must stress that ME: A is far less a cover based shooter than the old Unreal Engine 3 based trilogy. More often the game pushes the player to attack in more open environments, relying on vertical attacks from above with the jump jet tactic and manoeuvring quickly from side to side around the battlefield. Adapting to this larger form of fighting is refreshing and fun. 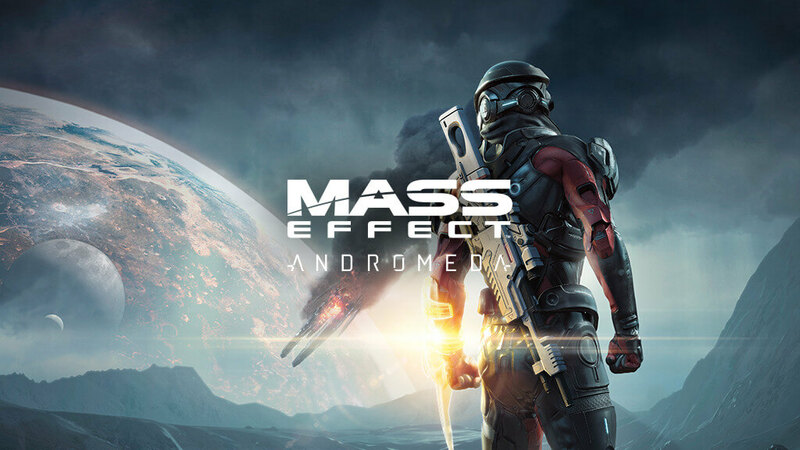 Perhaps the issues that bothered so many with Andromeda simply became an internet meme thing, taken out of proportions, because the game is one of the best Mass Effect games released in my opinion. Falling just behind ME2's fantastic revision of gameplay and presentation over the very first game. It may not be an opinion I share with the general public, but at least I made it on my own through hours of play. My best tip is simply to give the game a few hours by yourself instead of judging it by the loudest complaints on the net. 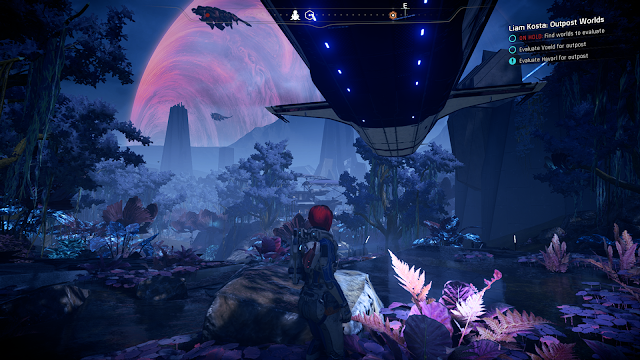 I found the freedom, the focus on exploration, the way you build up planets and colonising, all to give a fantastic sense of accomplishment and a fresh new beginning to hopefully a new Mass Effect trilogy. I genuinely felt like I was changing the future for mankind together with the alien races, pioneering space exploration. Perhaps it's just my personal taste that ME:A so well suited, but it's definitely a game I would not believe the hate about and simply try for yourself. My favourite game of the year so far with a fantastic mix of RPG, third person shooter action and adventure exploring. Exploring huge planet surfaces and terraforming them is breathtaking. Far more expansive worlds to discover and explore than before. Gameplay feels satisfying, with lots of variation in attack and defence types. The side quests are can get repetitive at times. Facial animations can look strange at times and the running looks stiff. Limited visual customisation options, both for characters and armour.